C'mon nokia price is expensive? would have had a price same w/ Xperia almost same features:-( I'm very disappointed with Nokia competingamong highprice phone with phones that has average features. AnonD-4340, 19 Nov 2011yah, androids flash support isnt bad, but in total browser compatibility the N900 is still kin... moreNokia N900 !!! What did you mean by full browser??? Nokia N900 (Meamo4&5) has the Mobile version of Mozilla Firefox web browser. Correct me if it's wrong! AnonD-12237, 19 Nov 2011IP4s is the best for browsing. Its fast and because the battery last the longest of any phone ... moreyah, androids flash support isnt bad, but in total browser compatibility the N900 is still king. Android uses mobile browsers, ip and N9 does also, N900 was the only phone ever to use a full browser. So why this big step backwards for nokia, N9 is the successor of N900 but browser compatibility has gone from top to the bottom? subho_dreamnight, 19 Nov 2011nokia n9 doesnt support flash on web browsing.i like my phone samsung galaxy s2.much more fun... moren900 is way back 2009..check ur list bro..u cant judge a phone w/out handling it over a month or so..
ALS, 19 Nov 2011can you change the black background on the nokia n9? different themes? No you can't.you only can change the wallpaper for the lock screen. i want to buy myself one in pink or is it orange,aint sure.im in south africa and ive looked everywhere for a different colour,if possible can u let me know whether we have other colours except for black!!!!!!! 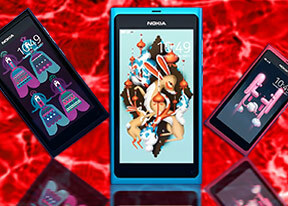 can you change the black background on the nokia n9? different themes? nokia n9 doesnt support flash on web browsing.i like my phone samsung galaxy s2.much more function than n9.my nxt phone may be nokia n900 if it comes in market. Im interested in the N9 but not sure what color to get. Black is sleek but kinda boring....the cyan looks great in some pics but but not others. I think some cameras overexpose/underexpose so its difficult to see the exact shade of blue..unfortunately the N9 is not available in my country so I can't pop down to a store for a look. What color did you buy?? ZiiimZooon, 19 Nov 2011My Nokia N8 isn't louder than my N9 :pOMG both the loud speaker and sound output of the N8 is louder than N9 by a mile. Just set both device volume to 50% and hear the difference. Don't set to 100% or else the N8 will bust your eardrums. Even GSM arena has done a test to prove this. Just read the N9 review. AnonD-8088, 18 Nov 2011I like most things to do on my phone are: 1.Browsing Internet. 2.Listening Music. 3.Playing... moreIP4s is the best for browsing. Its fast and because the battery last the longest of any phone for web browsing. Also android is good for browsing too because its got full flash support. N9 web browser is really fast and light, its has the highest HTML5 score of any phone, but its a shame that its too basic so it doesn't have a lot of features. For example no word editing, no copy and paste and now hitory. Getting my nokia n9 replaced with the htc sensation xe today.. ive been facing way to many issues and ive only had it for a week and a half.. its a nice phone, just not for me.